Anyone who’s opened a bottle of Manhattan Special — the espresso soda that was invented in Brooklyn circa 1895 — might think that carbonated coffee is due for an upgrade. Despite decades of innovation in the way coffee is sourced, prepared, and sold, the addition of bubbles is an innovation that has largely been ignored. That, however, appears to be changing thanks to a collection of coffee nerds and roasters large and small who recognize carbonated coffee as an idea that’s time has come — and one that’s about to hit the mainstream. For the most part, the tech used to carbonate coffee is akin to the same process used to carbonate something like beer: In the heart of innovation-rich Austin, Texas, there’s an increasingly famous variety called Black & Blue, pioneered by roaster Cuvée, that’s dosed with nitrogen to give it its fizz. Elsewhere, Stumptown has been known to dabble in gas-assisted tap systems. Even Starbucks last year was revealed its “Fizzio” line, wherein just about any drink can be ordered in with bubbles simply by asking. But a new start-up called Coffer, which is based in Austin and officially launched this year, is doing something entirely different, and that’s what makes it the most exciting project of the bunch. Coffer founder Kevin Chen says the company — now a four-person team — traces its origins to the moment when he pumped carbon dioxide into a batch of cold brew, something akin to putting a liter of leftover coffee through the SodaStream. “I tried forced carbonation and I didn’t like the results,” Chen told the coffee blog Sprudge, explaining the large bubbles made for an unbearably bitter drink (imagine Manhattan Special without the sugar). So Chen went another route, eventually hitting on his Eureka moment: fermentation. Cold brew gets mixed with a little cane sugar and an undisclosed type of yeast. Like Champagne or hard cider, it then gets fizzy (and perhaps a tiny bit alcoholic). Though Chen understandably wants to keep the rest of his process under wraps, the results of the fermentation are immediately apparent when you pop a bottle of Coffer: It has a light-brown head when poured, which dissolves into a swirl of oils. The taste is only vaguely sweet, and its bubbles — which are in fact quite tiny — give way to long, almost fruity coffee notes. When it’s very cold, the drink resembles homemade beer or soda more than it does traditional coffee. It has a surprisingly large and complex profile for something made from just coffee, sugar, yeast, and water. The Coffer project — the name is a mash-up of Cof-fee and Fer-mentation — attracted industry recognition from the beginning, including some from the heavyweights in attendance at the Specialty Coffee Association of America’s event, where Coffer made its big debut in April. 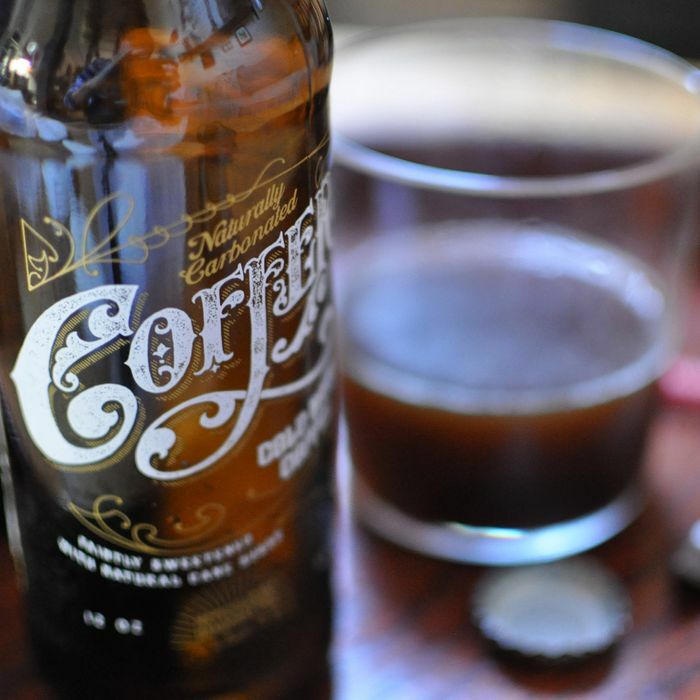 Granted, carbonated cold brew is still a microscopic aspect of the coffee business, but Coffer’s unique natural fermentation process creates a lot of opportunity. “We’re always experimenting with different techniques and flavors,” Chen tells Grub, which means it’s not difficult to imagine something like different vintages of carbonated cold brew coming down the supply line — another idea for cold-brew connoisseurs to get excited about. As of now, though, Coffer is still only available in a handful of Texas mini-marts and specialty shops, so Chen is mostly focused on national distribution, which he predicts is still between four and six months out. For a company that’s barely half a year old, and still made by a tiny handful of people, its larger rollout will be the true test of the idea’s potential. But given the number of other people who are dashing to create something similar, it seems Chen may have a knack for timing.